Early winter is a great time to get outdoors. The cold, crisp air is exhilarating. There are no biting insects, and there are fewer people on the trails. The quiet and solitude is remarkable and most enjoyable. 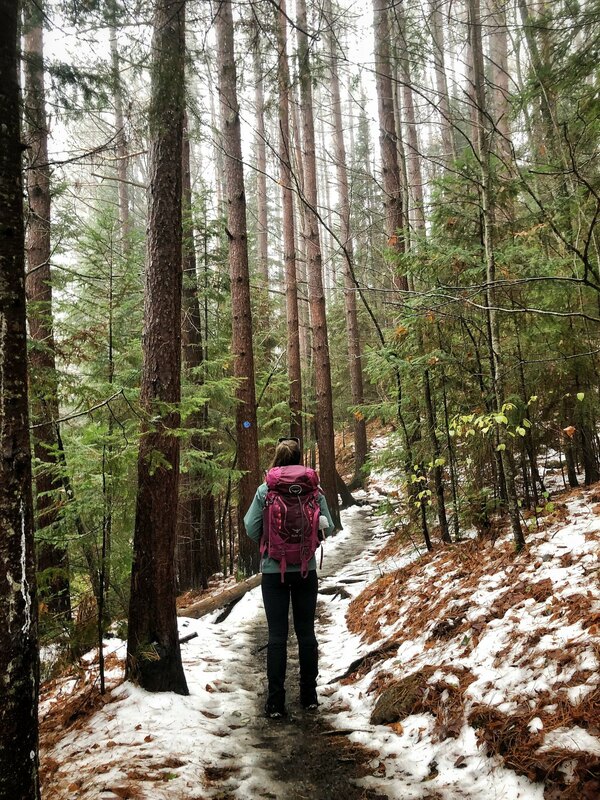 You can find more information on winter hiking safety and what to pack on our website. Plan and prepare ahead by checking the weather and trail conditions before you go. 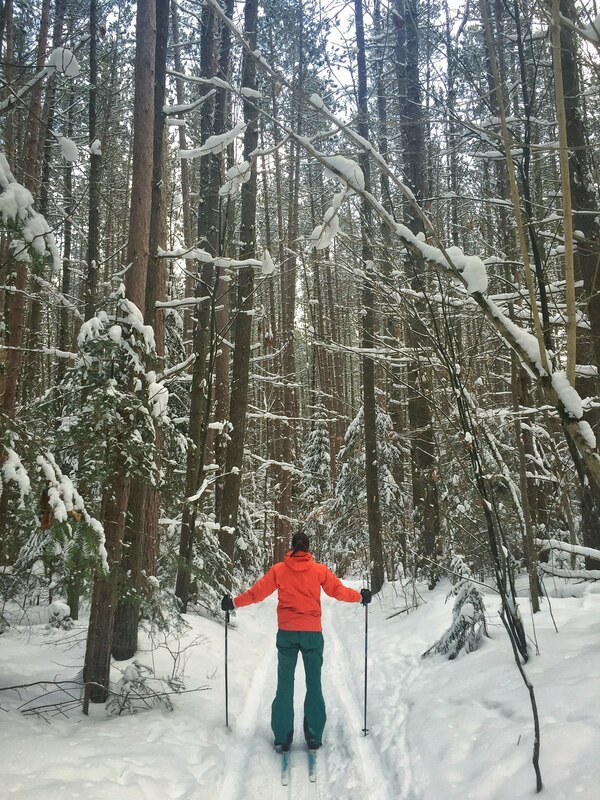 Know your route: Trails can be harder to follow after fresh snowfall. Research your route ahead of time and familiarize yourself with junctions, land markers such as ponds or river crossings, and the length of the route. Inform someone of your travel plans: Let them know where you are going, your planned route, when you plan to return, and emergency numbers to call if you do not return within reasonable time of your scheduled time. Practice Leave No Trace to protect our lands, trails and wildlife. Snow deeper than six inches adequately protects underlying vegetation from trampling. Thus, nearly any surface covered by enough snow is considered “durable”. Stay on deep snow whenever possible to help protect our trails. Snow does not contribute to the decomposition of human waste. Bury your waste deep enough into the soil. If the ground is frozen, prepare to carry your waste out with you. Pack a biffy bag or thick plastic bag to carry out all waste. Winter Weather: Snow, ice and below freezing temperatures are present throughout the Adirondacks. Snow depths currently range from four to 15 inches. The eastern and southeastern margins have four to eight inches. Snow is deeper in the higher elevations like the High Peaks region and other mountains over 3,000 feet. The sun sets earlier – Always carry a flashlight or headlamp. Seasonal Access Roads: Currently all but two seasonal access roads remain road open. DEC does not plow seasonal access roads. These roads are covered in snow and may be muddy. DEC strongly recommends the use of four-wheel drive vehicles on seasonal access roads. Ice on Waterbodies: Ice has begun forming on ponds, bays of lakes, slow moving streams, and backwaters of rivers. No ice is safe at this time. Although ice may have snow on the surface, it is not thick enough to hold the weight of a person. Ice will remain unsafe until temperatures fall below freezing for a significant continuous period. Hunting Seasons: All big game, small game and waterfowl hunting seasons are open, and others will open soon. Hikers should be aware that they may meet hunters bearing firearms or archery equipment while hiking on trails. Please recognize these fellow outdoor recreationists have the legal right to participate in this activity on forest preserve and conservation easement lands. Hunting accidents involving non-hunters are extremely rare. Hikers can wear bright colors if it makes them feel safer. Trail Conditions: Snow and ice are present on all trails. Snow depths vary depending on location and elevation. 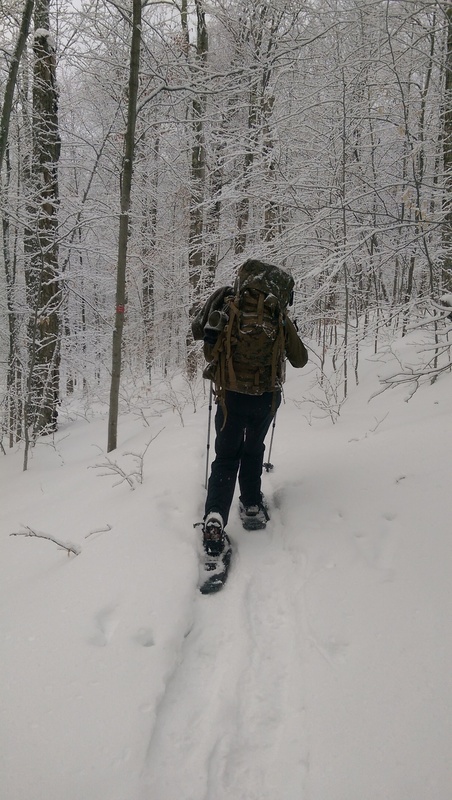 Check snow depths where you plan to hike and carry and use snowshoes where warranted - Snowshoes or skis ease travel on snow and prevent “post holing”, which can ruin trails and cause sudden falls resulting in injuries. Carry trail crampons on icy portions of trails including summits and other exposed areas. Stream Crossings: Rocks will be icy along streams and in streams. Wear trail crampons and use hiking poles when traversing ice covered rocks. Water Temperatures: Water temperatures are cold. Ice has begun forming on ponds, bays of lakes, slow moving streams, and backwaters of rivers. Regulation requires everyone on motor boats less than 21 feet, row boats, canoes and kayaks wear a Personal Flotation Device (PFD, aka Life Jacket) between November 1 and May 1. People immersed in cold waters can lose the ability to think clearly and move quickly after only a short time in the water. Anglers fishing from steep river banks or wading in streams and rivers should also wear a personal flotation device. William C. Whitney Wilderness: Lake Lila Road is closed for the season. The road will be plowed so trucks and other heavy equipment can access and work on the rail corridor near the Nehasane Station. The road will not be skiable until the work is complete. High Peaks Wilderness: The gate on Corey’s Road will be closed the first week of December to accommodate logging operations in Ampersand Park. Parking will be available at Raquette Falls Trailhead. Vanderwhacker Mountain Wild Forest/Boreas Ponds Tract: Due to the recent snowfall, Gulf Brook Road is closed. It will reopen at the end of the spring mud season. West Canada Lake Wilderness: Spruce Lake Lean-to #1 and #2 were restored this past season by volunteer crews from Lean2Rescue. Deer River State Forest: A portion of the Conservation Road, located immediately north of the Adirondack Park, has been flooded due to beaver activity. The road will reopen again once the flooding has been addressed and any necessary road repairs have been completed. Independence River Wild Forest: Big Otter Lake Road has been rehabilitated up to Tommy Roaring Brook. The road will be temporarily blocked beyond Tommy Roaring Brook until further rehabilitation occurs. Centennial Scoot Trail (3.2 miles) is the major through trail connecting the two parking lots. The trail gently rolls through mixed hardwood and coniferous forests from the South Trailhead. The trail intersects part of the old historic Glenfield and Western railroad system about 1 mile from the trailhead. The Bear Ridge Trail's southern intersection is located approximately 1.6 miles north of the trailhead, after which skiers will find themselves on a high bank overlooking a stream. The Bear Ridge Trail's northern intersection is located 0.5 miles south of the North Trailhead. The section of trail between the northern trailhead and the Bear Ridge Trail includes some easy up and down hill sections and a steep climb/descent at either end of the section. The trail between these hilly sections follows the edge of an open beaver meadow, crosses an old beaver dam/manmade impoundment, and crosses two small bridges and streams. 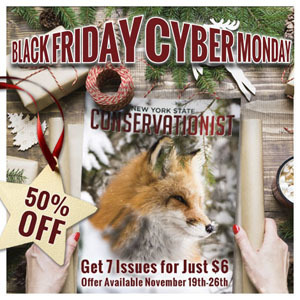 *BLACK FRIDAY/CYBER MONDAY SALE* Conservationist magazine- 7 Issues for only $6! Buy a subscription for yourself or give Conservationist as a gift, and enjoy New York's outdoors all year long! Habitat Supporter Patch- Whether you are an angler or hunter, birder or photographer, purchasing a $5 Habitat & Access Stamp is the perfect way to help conserve New York's remarkable wildlife heritage and habitat. The 2018-19 Habitat & Access Stamp features a barred owl. DEC Camping Gift Card- Campground gift cards are the perfect gift for those hard to buy outdoor-enthusiasts and are redeemable at all NYS DEC campgrounds. Trail Supporter Patch- For just $5, anyone can support the maintenance and enhancement of hiking, biking, horseback riding and other non-motorized trails on State lands. The current patch design is a red disc with white lettering which resembles trail markers used by DEC to mark east-west directional trails.